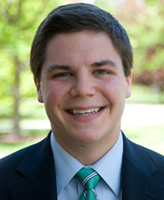 Michael O’Brien, the valedictorian for the class of 2012 has enjoyed a full and rich Notre Dame experience. He will graduate this month with a political science major, a philosophy minor, and an International Business Certificate. Originally from St. Charles, Ill., O’Brien lived in Keenan and Siegfried halls during his years at Notre Dame. In addition to copious research and many academic pursuits, O’Brien also served as the president of the College Democrats, a vice president of Circle K, and an editor of a journal, Beyond Politics. Here he answers a few questions and reflects on his time at Notre Dame. What made you decide to come to Notre Dame? Notre Dame is the first college campus I ever visited. When I was eight years old, I attended the ND-Navy game, for which my uncle was a student manager. He even grabbed me a pair of Autry Denson’s gloves! Memories of visiting the Grotto with my dad and playing frisbee on South Quad stuck with me, and I knew growing up that if I ever had the chance to study at a place that balances community and academic rigor so perfectly, I would take it. My campus visit during my junior year in high school sealed the deal, and when I received the famous “Welcome Home” admission packet the next year, I announced immediately to my family that I would be a Domer. Everything just felt right, and my experience here has confirmed my initial intuitions. What is one of your favorite memories from your last four years here? I have a lot of wonderful memories from the past four years, but one that comes to mind is my experience in the Notre Dame London Program. Here, I had the opportunity to live and study alongside more than one hundred of my classmates in an entirely different setting. In addition to making new friends from Notre Dame, I met several kind and interesting British citizens while interning in the House of Commons in Parliament. I am still amazed that I got to work in a palace three days a week, and I am grateful to have been able on many occasions to mix fellow Notre Dame students and parliamentary staffers for things like dinners and pub quizzes. This summer, I will co-author an article with my now former thesis advisor, Sebastian Rosato, on some modern questions in international relations relating to U.S. primacy. I will then attend the University of Chicago Law School as a Rubenstein Scholar, which will give me significant financial freedom in choosing my career plans after law school. As I am ultimately interested in working in government and possibly in academia, I might pursue a joint-degree program while at Chicago by studying either economics or international relations at another university (most likely somewhere such as Princeton, Oxford, or Cambridge—I would like to make it back to the UK at some point). I also think it would be a cool experience to clerk for a federal judge after law school. Beyond my immediate and short-term academic plans, I have not charted out the specifics of my future very much. One of the great things about being a young Notre Dame student is that we can all follow our passions and try our hands at new opportunities while still being able to land on our feet and try something else if things do not work out. Personally, I am passionate about public service and public policy, so I anticipate that I will someday work in or around government. Where I will ultimately end up and how I will get there are part of the excitement in the journey. How are you planning to write your speech? What do you most want to communicate to the class of 2012 at Commencement? One of the oddities of the long valedictorian selection process is that candidates must write their speeches well ahead of time. So, my speech has actually been written for quite a while and I am now in the process of refining it. When I wrote the main content, I hoped to articulate how my classmates feel about their time here, as well as address realistically the challenges and pressures that exist “outside the bubble.” There are serious divisions and disagreements in the world whose apparent irreducibility creates combative environments in many spheres of life, contributes to existing problems and creates new ones, and generates pressures on us to turn inwards. I try to be honest about the more depressing features of the world outside Notre Dame and discern the role of our University, our graduates, and our traditions in light of them. What is one thing you would have done differently over the past four years? This is a tough one. Overall, there is not much I would have done differently, but I guess I can name a few very minor changes. As far as events on campus go, I regret that I did not participate in Bookstore Basketball and the Fisher Regatta. In terms of academics, part of me wishes that I would have taken a new language at Notre Dame (Instead, I took a semester of upper-level Latin, which was enjoyable, but not radically new because I took Latin in high school). On balance, however, I have trouble looking back on my four years here and not viewing them as ideal. From classes, to clubs, to friendships, my experience has been amazing. As Father Robert Griffin put it: “There has always been, for me, a beauty surrounding Notre Dame and her people, so that if one had only this experience, with neither hope of heaven nor expectation of glory, it would be enough." I have come to understand why he felt this way. Originally published by Rachel Hamilton at al.nd.edu on May 14, 2012.